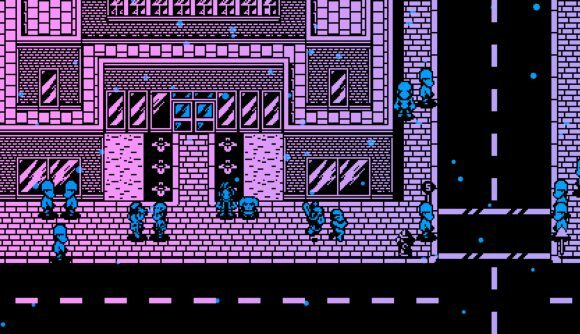 She Dreams Elsewhere is just such a title – created by young indie developer, it takes on issues like self-identity, existence, and mental health using the building blocks of games like EarthBound and the original Final Fantasy. She Dreams Elsewhere is about a young woman named Thalia Sullivan. She’s comatose, and the game is about her journey through nightmares that are preventing her from reawakening. There’s an 8-bit aesthetic to the environments and character sprites, with a color scheme cribbed from old RGB cathode ray tube monitors. But those old-school elements are mixed with more modern effects, as screen ripple and shatter as Thalia and her companions move through her stricken dreamworld, fighting enemies in turn-based JRPG combat sequences. The game is the work of Davionne Gooden, a 21-year-old indie developer and filmmaker who says he’s spent the last three years making She Dreams Elsewhere. He’s drawn from his own experiences with depression and anxiety. “I figured it’s about time that a game said ‘It’s okay to not be okay,’” he said. She Dreams Elsewhere also features a diverse cast, and as Gooden says, it’s a deeply personal story. There’s an hour-long free demo to try out on Steam, too. The full version of the game should be available later on this year, and you’ll be able to buy it on Steam or itch.io (which will also have Mac and Linux versions available) when it launches.